Port Isabel police honored one of their own last Thursday when the department held a rededication ceremony outside the police station. The department honored former Chief of Police Lorenzo Rosalez by unveiling a new sign on the building’s façade bearing his name. 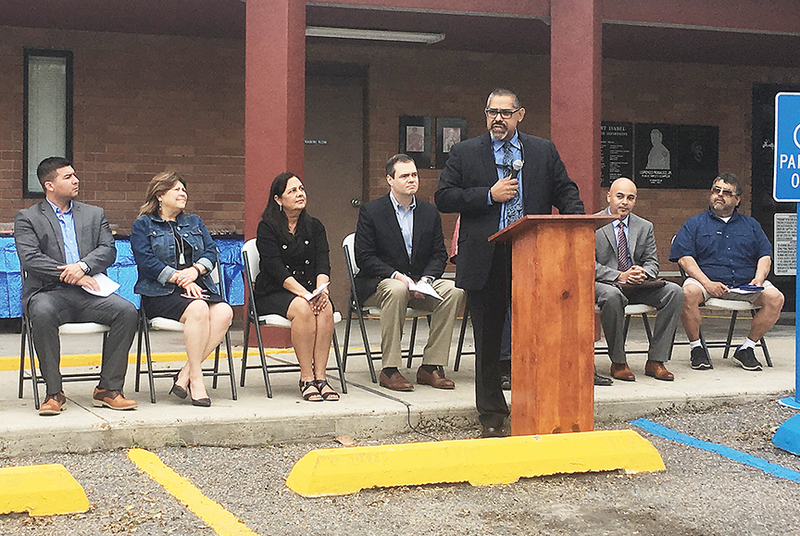 Several local dignitaries were in attendance at the ceremony, including top law enforcement officials from the surrounding area, such as Laguna Vista Chief Tony David, Cameron County Parks Chief Horacio Zamora, and Pct. 1 Constable Pete Delgadillo, among others. Members of the Port Isabel City Commission were on hand, as well as State Rep.-elect Alex Dominguez. Members of Rosalez’s family also gathered from across the state to pay honor to the man who inspired a life of public service among them. “Lorenzo was a kind man, hardworking guy. Always a family man, always with (his) kids,” Port Isabel Mayor Juan Jose “J.J.” Zamora said of Rosalez. The pair had served in the police department together. Zamora has also served as Port Isabel’s top cop.